This soup is so great and the magic of it is in the cashew cream and silky texture of the soup which is really achieved through a high powered blender. Vitamix has offered $20 off and free shipping if you are in the market for a new awesome blender! Hi Guys! I can’t believe that we are here most of the way through September. It kind of freaks me out that time is going by so quickly. I am in Santa Barbara next week (I have never been there before so please let me know where to go and what to eat!!!) and then we are off an running. I am in LA the week after and then Coco and I are headed to Vancouver, BC to set up a second home there. I will keep you posted and you can definitely follow all the adventures over on instagram too. Speaking of Insta- has anyone been following along on my insane Spin challenge? 100 spins before i turn 40 in December. It’s pretty manic, but I am loving it. I will write a post about it, so let me know if you have any questions. But for now, I am still here, and just working, spinning and trying to eat really well before I hit the road (you know how hard that can be on the diet!) I am also always trying to work with the easiest possible dinners and simultaneously use up the pounds and pounds of tomatoes that are still coming out of the garden! I know you are going to love this- it’s absolutely so easy and very delicious! Place 1 cup of raw cashews in a bowl and add the water which should just barley cover the nuts. Let them soak for 20 minutes. In a medium-large pot add the olive oil and the onions over medium heat. Sprinkle with salt and cook 5 minutes until the onions are translucent. Add the garlic and cook another 2 minutes. Add the tomatoes and the broth. Turn the heat to low and simmer with the lid on for 20 minutes. At the 15 minute mark, add the basil. Add the cashews and the water to the jar of a blender and puree on high until the cashews have turned into a thick cream. Transfer to a small bowl. Working in batches, add the tomato soup mixture to the jar of a blender and puree on high. When all of the soup is pureed, transfer it back to the pot and bring back to a simmer. Whisk in the cashew cream and season to taste with kosher salt. Serve hot. Glad to hear you are mobile! I love the color of this soup. It screams FALL! Love the simplicity of this, that it’s vegan, that you used cashews as the base, and I would inhale it! Pinned! I haven’t tried using cashew cream yet but it seems like such a great way to add decadence to a vegan dish. This soup sounds wonderful! Love the simplicity of this soup – so yummy looking. I also love that it’s made with cashews! This sounds incredibly delicious! Glad your foot is healing nicely. My husband has been in the hospital with major foot surgery and undergoing hyperbaric treatment to help with the healing. That’s a little known secret. First-off, I am glad you are mobile and rocking that sweet boot, hope you are feeling better and better every day. This looks sooo amazing, comforting and so creamy. Cashew cream is the best ever!! YUM. This is the prettiest bowl of tomato soup I’ve ever seen! Yay! So glad to hear you’re in a walking boot! I loooove tomato soup and this one with basil w/those cashews just sounds amazing! Wow – never even heard of cashew cream. I will definitely look into using it! This is what it’s all about – learning to use new ingredients. Thanks, Heather. Here’s the way I use up tons of extra tomatoes this time of year- I whip up a batch of chef Barbara Lynch’s tomato jam. I can never make enough of it. Oh my gosh, I’m so happy you are off crutches. What a nightmare. I have SO many tomatoes to use up…can’t wait to try this soup. I want a bowl for lunch! I’m so glad to hear you have a boot and no more crutches! This soup looks incredible and I love the cashew cream! I can’t wait to make this once all the tomatoes ripen in the yard. Pinned for later. Ooh I love the cashew cream in this to make it creamy, I just happened to have made some this week! Can’t wait to try this gorgeous soup out! Pinned. Thank you Laura! It is amazing what that cashew cream does for the soup- it totally emulates real cream- even in the color! Just came across your blog and am so glad I did. The color on that tomato soup is gorgeous. I love the pale peachy-orange-ness. At first I thought it was pumpkin. Thanks for sharing. Thank you! It is a delicious soup and a great alternative to using dairy fat! This is probably the best tomato soup I ever had. And it makes such a big batch, that I am going to try out adding some other spices to the left overs, such as cumin, curry, turmeric… the sky’s the limit. Thanks Heather, you’re the best! How many regular size tomatoes would give you 8 cups? I chopped tomato = 1 cup I would think? Have you ever made this a day ahead? Is it OK to combine all ingredients, or should I wait to add the cashews? Would this recipe freeze well, or does the cashew cream render that inadvisable? I like to make soups that I can freeze extra portions of for days I don’t have time to cook. Thanks! Absolutely Janee! It freezes really well! 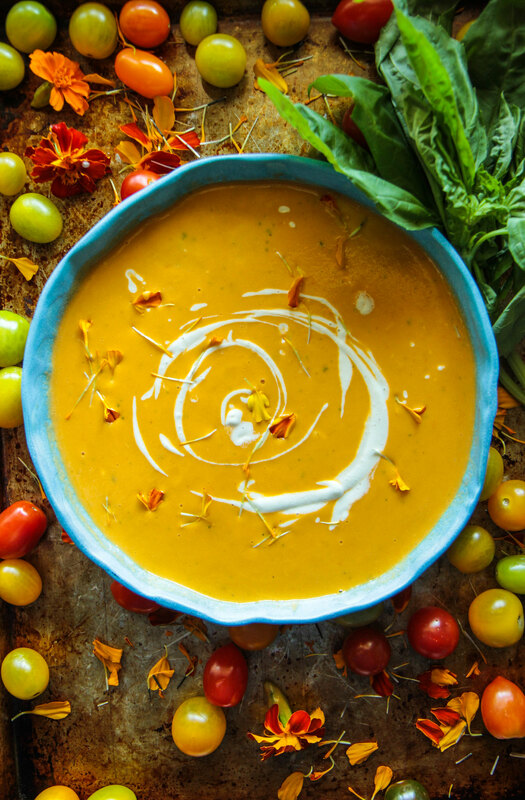 Pingback: Creamy Tomato Basil Soup (vegan) | 2015: Our "SOUPER" Year! can’t seem to get to the recipe. i click on “recipe” and i go nowhere. please re post. this one doesn’t seem right. Thank you so much Bob! I just fixed things up! What are the amounts if you need to use boxed tomatoes? Sadly I don’t have access to fresh ones. No problem Trixie! I would use 2 28ounce cans of tomatoes- whole or crushed! What a great idea Patricia! I would just start with one can, rinsed and drained and puree that with the rest of the soup! If you try it please tell me how it works! Hi, Heather! I love all of your recipes! Just wondering, do you think a food processor would suffice in place of a Vitamix? Hi Penny! I think that you should definitely give it a try with the cashews- but don’t put hot soup in there or you may have a distaster! 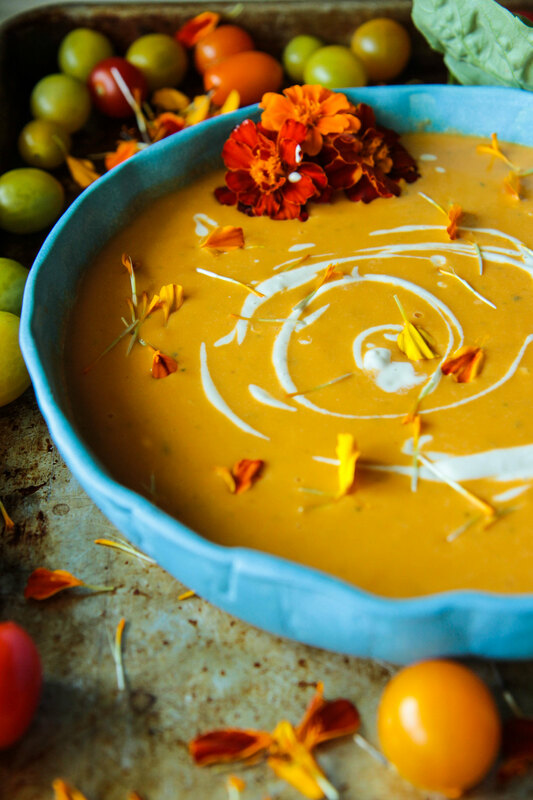 The MOST perfect Fall/Winter soup ever! 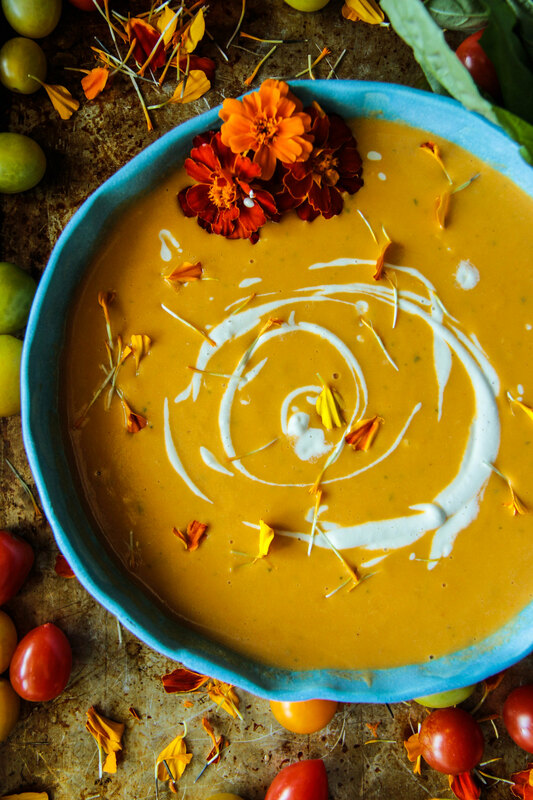 What a perfect soup to celebrate the start of Fall! Love the idea of using cashews to make it creamy and dreamy! Such an exciting time with Coco! mwah! its a perfect transitional soup into these cold months! Love the cashew cream in there!! Thanks Erin! It does make it extra creamy! Looks so cozy and delicious! Perfect for dinner on chilly fall nights! If you have to use store-bought tomatoes or tomatoes from a market (not canned), which kind would provide the best flavor or otherwise work best with your recipe? So excited to try this! I’ve made broccoli cream soup with the cashew cream, and I just knew someone would have a great tomato basil cream recipe too! Hi Meg! ! I would just use whatever looks ripe! Maybe Romas or vine ripened? This is THE BEST tomato basil soup I have ever had! I have a dairy allergy, so heavy whipping cream is out for me. But when I was little, my mom grew tomatoes and basil in the backyard, and at the end of the summer she made this incredible creamy tomato basil soup. I think about it all the time, and have tried many dairy free recipes over the years that were okay, but this one is a keeper for sure! It tastes EXACTLY like the soup she made that summer! I also love the simplicity of the ingredients. Thanks so much! We’ll be making this for years to come!